Lazy Rivers are the perfect addition to any pool amenity deck that seeks to give kids and families hours of leisure floating on the water. From world-class resorts in the Caribbean to municipal aquatic centers, we have designed lazy rivers for all types of projects. 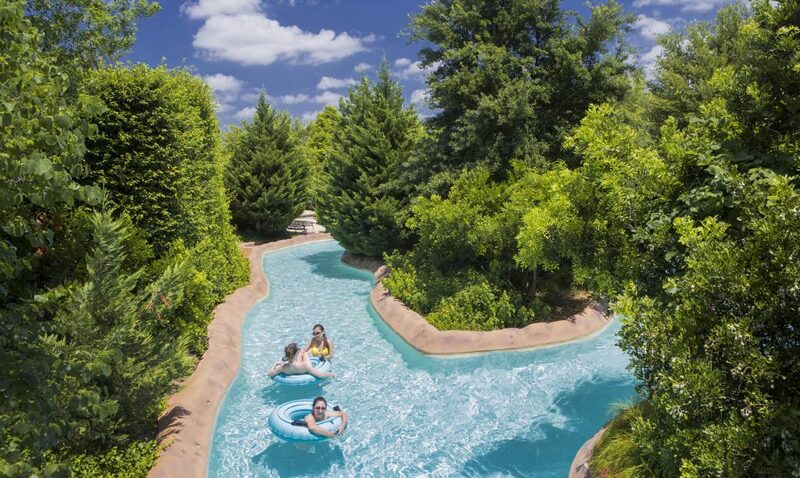 Our lazy rivers can be designed to accommodate any scale of site and any style of use: some lazy rivers feature peaceful, steady movement while others incorporate speed and waves for a more active rapid experience. Whenever a client approaches ADE with ideas for a lazy river, our creative team assesses the project site with three things in mind: space, function, and design aesthetic. 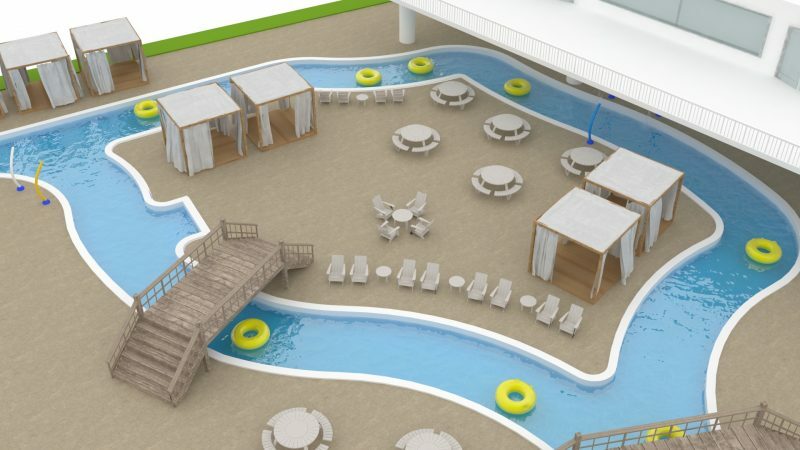 The pool deck area needs to be large enough to accommodate the gentle curves of a lazy river without the kind of space-saving switchback turns that wouldn’t be enjoyable to guests. As well, we work with our development partners to determine how they want their lazy river to operate: as a slow-moving experience with innertubes or a faster current with interactive water sprays or splashing elements. Lastly, it’s important to decide the theming of the pool area and whether that influences how landscaping will create a more secluded ride down the river. Any lazy river as part of a poolscape is one of the more complicated elements to design, which is why it is so imperative to have an experienced aquatic engineer as part of the project team. When it comes to calculating the correct flow rates, thruster pumps, and propulsion systems, our engineers possess the knowledge to put together an aquatic system for any circumstance. We also provide owners with an understanding of how their river will operate in terms of entrance and exit sites for riders and innertube returns and collection points. By its very nature, the long perimeter of a lazy river brings its own set of construction complications, from pouring the concrete in phases to installing the pumps that create the current. ADE provides the oversight to ensure that the project is built to the exact specifications, and that any hiccups arising on site can be remedied without major changes to the scheduled deliverable. 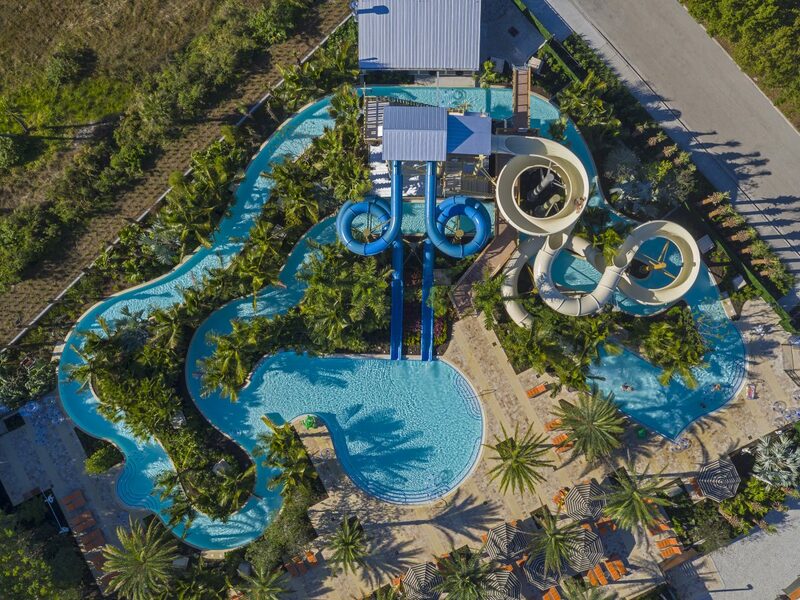 In our long history, the lazy river amenities our team created for our development partners have run the gamut from playful and kid-friendly to relaxing and quiet. With every one of them, we assembled an amenity that gave the owners the peace of mind knowing that their poolscape was in the hands of experienced designers and engineers. Let us help you design the perfect fit for your lazy river vision.